The steam engine whistled loudly and bellowed out huge column of black smoke as the train entered a very small railway station called Kosi Kalan! It was a cold December morning as I heard the cries of ‘ Samosa’ , ‘Garam Samosa’( Hot Samosa)! My small face was pressed against the window of the train’s compartment as I called the hawker and my parents bought the piping hot samosas for me and my brothers for our indulgence! I was the eldest and must have been around five years old then! These are some memories of my first bites of this lovely snack with tamarind and coriander-mint chutney as accompaniment! We were on a trip to Mathura, the birth place of Lord Krishna and our native place! I never imagined that this would be the beginning of my longest romance with any kind of food. Regardless, wherever I traveled, I soon realized that this fusion dish is a perfect blend of north, east, west and south India and any other food pales in comparison! A popular appetizer and a snack which has followers not only in all parts of India but world over and the variants of Samosas are available in many parts of Asia, Mediterranean, Africa and finds acceptance globally in Europe, Americas and Australia also. Samosa was an important element in the journey of life this far! In the growing years when I started going to school, I would save money by walking to school instead of going by the bus to wait for the Samosa wala’ to bring steaming hot samosas to placate my salivating mouth. How many times I burnt my inners of the mouth by misjudging the heat of the emanating steam. I learnt my lessons in Physics on ‘latent heat of the steam’ and its capacity to burn by those bites into the samosa. Samosa continued to win all the battle of arguments on the coffee sessions in the college canteen and it was next to impossible not to find anyone who would not like the blissful food! Twice in the week the NCC parades would end with a coupon of snacks for which Samosa was the best deal! I travelled to many parts of the country and had the luck to flavor the best samosas which I recount here. 4. In South India the samosas are available in every nook and corner and have mixed vegetable, potatoes, onions etc as a filling. In Maharashtra and Gujrat, too no ‘chaat’ is complete without a samosa . I lived in Goa whilst serving in the Navy and ‘Chamuchas’, a Portugese variant of the dish was popular and was usually filled with beef, pork and lamb! 5. In far east the samosas are referred to as ‘Singhara’ and for the best variety, ‘Tiwari’s’ at AJC Bose Road in Kolkata is not to be missed. Even some roadside food stalls sell excellent singharas. I tried some good singharas in Gauhati and Shillong too! 6. There is no town of UP , Bihar or Punjab where samosas don’t sell! I stayed in Patna for over eight months a few years back and had samosas for the dinner many a times from the vendor at Ashiana Road. Benaras, Mathura, Agra, Lucknow each town boasts of some of the best samosas! 7. Just after my marriage, I landed in Srinagar and soon after arriving I and my wife feasted on this lovely snack in Lal Chowk. We undertook a journey to Leh by road admiring the barren beauty to reach Kargil for a stopover at night. We were greeted by the Army Mess havaldar with a huge treat of samosas! 8. I waited outside the labor ward in Army Command Hospital at Pune while it rained incessantly through the night, eagerly waiting to hear the good news. Around 8.30AM I hopped to the canteen to get some samosas and the moment I returned I was informed by the nurse of the arrival of our daughter! 9. An Italian was working with me on a project a few years back and around lunch time we walked up to eat. On asking him what he would like, he answered, ‘Samosas’, his favorite. I did a bit of international travel and was surprised to find the variants of samosas in Israel in streets of Tel Aviv being sold as ‘sambusak’ filled with chickpeas and onions. In New York, I landed in a small restaurant run by a Pakistani origin that made very delectable samosas. 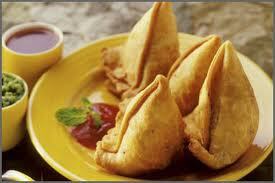 In Pakistan too different versions of Samosas filling of minced meat, chicken etc are available in most places. The ‘Patti samosas’ in Langkawi in Malaysia were a pleasant surprise! While on a trip to Bali in Indonesia I came across a variant of samosa with a filling of beef ! On a recent visit to Singapore , I was amazed to find half a dozen variants of ‘frozen samosas’ in Mustafa, the giant shopping mall!! This wonder fusion food was brought to India in thirteenth century by traders from Central Asia and still finds a place of pride in every function be it a birthday, wedding, or any festival cutting across religious barriers and loved by all unequivocally and cementing the bonds of friendship universally! Now I need not look far as my wife makes them for me at home! I agree that Samoosas are one of the most popular snacks in the country. Maybe it should be christened as as National Snack ! Rahul.." Una cita con samosas "
Muchas gracias por haber Dolly le gustaba leer acerca de este aperitivo. Estoy seguro de que tiene muchos alimentos se deleita en la Argentina también! Tiene una encantadora semana! You are right, nobody can resist Samosas, especially with garma garam chai, winter, summer or the rains. I don't think it can go well with coffee, but with tea it is a sure hit. i remember eating samosa to my heart's content, while we lived in Agra, Delhi, Calcutta, Gauhati and other places, and even here in Bangalore we get excellent samosas. I liked the Irani Smaosas of Mumbai, those tiny ones filled with just onions and green chillies, which goes well with their Irani chai. Yesterday too we had samosas, which we had bought for our guests. Rahul you are a true,true samosa lover,so am i,but your knowledge on the snack is astounding....the heading & the picture lured me into reading it without delay...sadly here in Rajasthan samosas are chock-full of chillies & this destroys their taste completely with the result that i am deprived of my favorite snack. I'm gonna have it rgt now. That was really nice to learn Yashi, that Samosas tickle your food buds too:)Enjoy! Nice post.Looks yummy. I haven't tried eating samosa. Spent many a summer vacations travelling to Mathura,Agra,Bharatpur and we loved the Samosa-kachori-jalebi ka naashta as kids.BTW,filling of a Samosa is a breeze but I can never get the covering and the crust right.Lucky,your wife can make it at home. Oh you too like, Valli:) So there is lots of company of samosa lovers:) Thanks! I just realized that there are plenty of other samosa lovers besides me, Akanksha:)Thanks! Beautiful piece. You don't know just how much I love Samosey. In fact I am really scared to go out for further study or job because I might not get my dosage of Samosey there. Welcome to my blog and Am happy that this post could revive some old memories!Thanks! When I went to London, we went to visit an 800 year old church in a small village. The shop over there were selling potato filled samosas which were quite tasty! Wow Sandhya:) That must have been great! You know there is a small Indian restaurant even at foothills of Mount Titlis in Switzerland which sells Samosas:) Thank a lot! I used to hate samosas but now that I am away from home I miss them! Distance makes the heart grow fonder for food too, Ria:) Agree! I think samosas are delicious. Gosh Rahul dear friend, you must have eaten so many samosas in so many places, Indian cuisine is very delicious. Wow Dianne! You too like:) Thanks a lot!! I love samosas, but don't eat them too often. This post is making me hungry (smile). Thanks for sharing. Wish the humble Samosa could read this mouth-watering homage. Crisp, with a piquant filling and tamarind chutney, Samosa is food for the soul. Thanks indeed for your equally tangy comment, Purba :) Wish the Samosa could read the post!! Hmm, samosa has been a great life saver during my travels. Yeah, with spicy-sour chutneys yummy! Can't help noticing how well travelled you are! The Tel Aviv sambusaks filled with chickpeas and onions sound intriguing. Didn't know samosas came from Central Asia - thought they were an Indian dish. Welcome to my blog and thanks for that nice comment! I know London has some excellent places that sell Indian food:) Will remember next time when I travel! Mmm... I do love veggie samosas! Oh You too love Samosas:) Great! Oh My Rahulji! All along the only thing I wanted to do was to buy one and gobble it down! And the fact that you have pointed out the samosa stalls all over India, shows how much you love this snack, and how much you have travelled!! And how often we associate personal incidents with food. My lead in London took me out for the first time to know me well, and guess wht he treated me with. Samosas from Embankment(I second my blog world's comments) Loads of memories with this snack. And so very perfect is your post sir! Am honored with your presence here, Sudha and imagine it was the humble samosa which brought you here:) A sincere thanks and hope I can offer you more similar treats! Hi Rahul, I enjoyed your telling of your history of this well-loved snack. From reading about all the different types of samosas you've had in all the different regions, I can imagine that you are quite the connoisseur on the dish! Which of all these you've tried over the years has been your favourite? Samoosas are also popular here in South Africa, but we have taken our own spin on it, you get cheese and corn, jalapeño and asparagus samosas here. You can even buy the regular type frozen in supermarkets here! You are so lucky that in India the freshly made hot samosas are so widely available and sold. I know what I am making for dinner tonight, haha! Samosa -- my favorite snack. Just a few days back I made them at home that too with atta for the outer covering. It was yum. Muh mein paani aa gaya :). So true Padmaja, that anytime is Samosa time:)I too read the fascinating story of Pak SC intervention to fix minimum selling price of Samosa:)Thank you! That was an exhaustive treatise on the samosa! Loved the picture and the taste of your first bite of the snack. I could almost taste it as a five-year-old you bit into it :) Only a connoisseur of the snack could have come out with this post. This is the best part of your blog -- your varied and interesting experiences on your travels round the world. Ha, Ha, Zephyr - A treatise on Samosa! Without the rich comments from a reader like you this post would be like a dark cloud minus the silver lining!A big thanks for so many kind words!! best food on earth!!! loved going through that list. thanks for sharing so many facts about samosas. Agree Debajyoti:) Thanks a lot! Zuzana, on the contrary you will find this in many big cities in Europe. The baked version of the same is served as patties with a filling of vegetables and also meat/ chicken etc..They resemble fortune cookie, you are right:) Wishing you a lovely week too..
May I take this as a compliment, Latha that Samosa continued to linger on thoughts:) If so thanks a lot, otherwise I am guilty of being a spoil sport like Menaka disturbing Vishwamitra's meditation!! Aha a lovely ode to the good ole samosa! I enjoy reading your stories!!! Not enough words to thank you Ashok, for your kindness to pass me the award and those words! Hi Rahul, samosas are my favourite. I just love eating them, never mind the calories. I have heard that Delhi has the best samosas in the country, I definitely want to try them. Love reading your stories, do you know? Keep the delicious love affair going. Well I sure love them Divya, but when it comes to food I do not mind having multiple love affairs:) Thanks a lot for your nice comment!! Was very interesting. I am also fond of Samosas. Now camping at Chennai I am able to get them practically everywhere. I too have a post (by my brother)on Dosas which is wait listed. 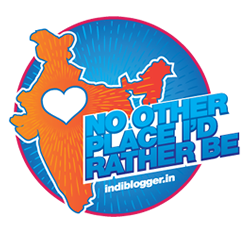 Thanks indeed PN for enjoying this post and also Samosas:)Look forward to reading on dosas, another favorite of mine! I loved the way the blog post started off. Am unfortunately not a fan of samosa :(! This is wonderful..You were talking about Samosa..But you said almost your biography. A wonderful mix of everything, from memories, childhood. career, travel, taste, all..how sweet they are..
Sam, that writing was just excellent and deserved all the praise:) The power outages were ridiculous but managed to survive them!Have a great weekend! Can we desi live without alo kay samosay ? Samosas are complete indulgence ..if they r hot n accompanied by tamrind dip. This is a really well written article. I'll be sure to bookmark it and come back to read more of your useful information. Thanks for the post. I will certainly comeback.